I know I don't update this blog as often as I used to. Juggling work on this site and Glitter Guide has been difficult for me. I still have plans for Sterling Style for the time being, but since I can't update it as often I decided to update my Tumblr a lot more. It's much easier for me to share photos and inspiration on that site. 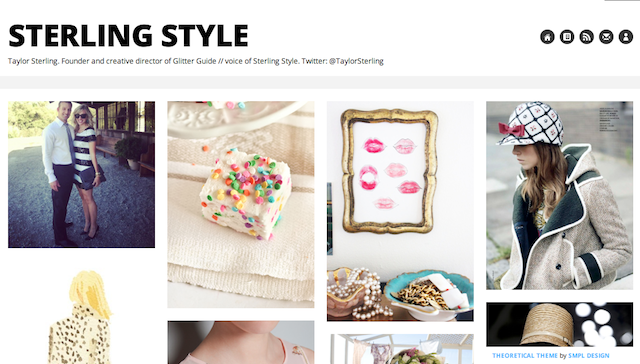 So if you're a fan of Sterling Style please follow my Tumblr to see what I am loving and some personal photos! Miss your posts! Loving the photos though. Thanks!! fun pics! Especially the cake with sprinkles, cute! Wow the collection of your photos are really very very stylish...I love been here because your blog enhances my knowledge regarding style and fashion...thanks! Thanks for doing your best to juggle everything! We all know you have a ton on your plate. i follow your tumblr and i love it. so much inspiration! Everything down to your tumblr is chic! Love the beautiful photos. Beautiful collection.... thanks for sharing...these pics with us. how hard is it to take a picture of your outfit, write a blurb and be done? its been a bit frustrating to fall in love with your blog only to be disappointed..
Its okay. I do understand you. It isn't easy to juggle work from blogging. Very rich and good collection. I like your photo so much. It's looks great. New outfit post on my blog "MILITARY JEANS"
I will follow you Tumblr. It's really a good website. Really miss your personal fashion photos! :( Feeling sad! You were my go to for ideas and I really related to your fashion sense. As a Mom of 2 I find it hard to stay in the know but it was easy when I was following your posts. I owe my mint jeans to you. :) I hope you can find time to post soon! Your blog provides inspiration to improves our skill and talent. I appreciate your writing ability.You covered such a nice points in this article it is interesting to read about the this subject.Thanks for this valuable peace of information. For me, design is like choosing what I’m going to wear for the day - only much more complicated and not really the same at all. I Like your site,iam sharing my friends excellent work.